Gauge/Size 14 - OLIVE - 0.069 (ID)in. -0.083 (OD)in. 15 - ORANGE - 0.059 (ID)in. -0.072 (OD)in. 16 - PURPLE - 0.053 (ID)in. -0.065 (OD)in. 17 - WHITE - 0.048 (ID)in. -0.058 (OD)in. 18 - PINK - 0.038 (ID)in. -0.049 (OD)in. 19 - BROWN - 0.033 (ID)in. -0.043 (OD)in. 20 - YELLOW - 0.025 (ID)in. -0.036 (OD)in. 21 - GREEN - 0.022 (ID)in. -0.033 (OD)in. 22 - BLACK - 0.02 (ID)in. -0.028 (OD)in. 23 - SKY BLUE - 0.016 (ID)in. -0.025 (OD)in. 24 - RED - 0.015 (ID)in. -0.022 (OD)in. 25 - BLUE - 0.012 (ID)in. -0.02 (OD)in. 26 - CREAM - 0.011 (ID)in. -0.019(OD)in. 27 - GRAY - 0.009 (ID)in. -0.016 (OD)in. 30 - LAVENDER - 0.012 (ID)in. -0.152 (OD)in. Standard disposable needles include a plastic (polypropylene) luer lock hub, with 304 stainless steel canula (or tubing). 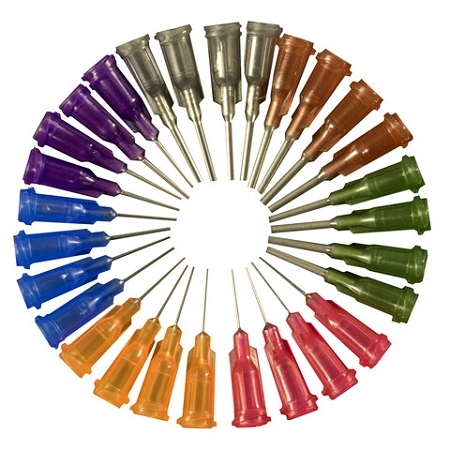 Needles are color coded based on the international standard and are bonded with a clear UV adhesive for exceptional strength. 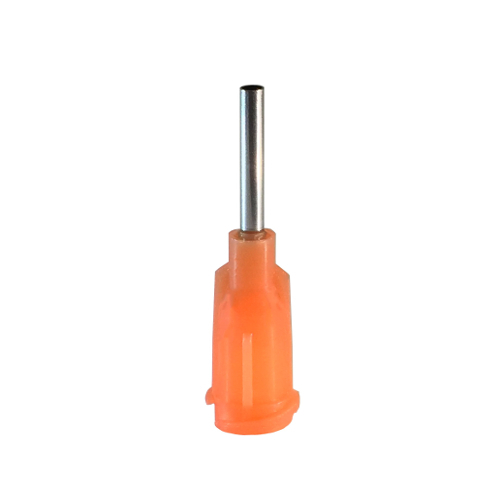 The luer lock utilizes an outside thread design for secure locking onto a syringe or valve. Needles are packaged 50 to a bag and are available in several lengths.